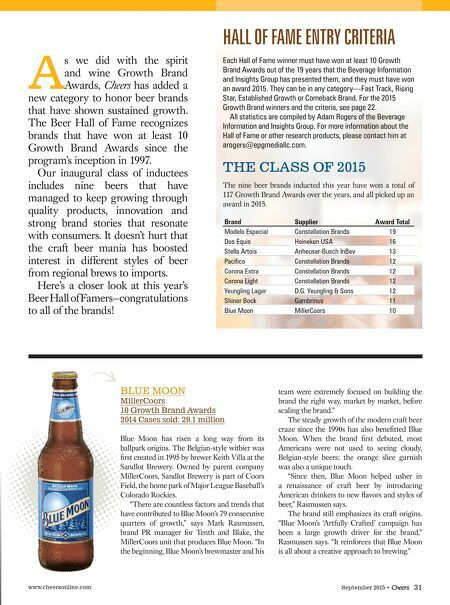 www.cheersonline.com 31 September 2015 • A s we did with the spirit and wine Growth Brand Awards, Cheers has added a new category to honor beer brands that have shown sustained growth. The Beer Hall of Fame recognizes brands that have won at least 10 Growth Brand Awards since the program's inception in 1997. Our inaugural class of inductees includes nine beers that have managed to keep growing through quality products, innovation and strong brand stories that resonate with consumers. It doesn't hurt that the craft beer mania has boosted interest in different styles of beer from regional brews to imports. Here's a closer look at this year's Beer Hall of Famers—congratulations to all of the brands! 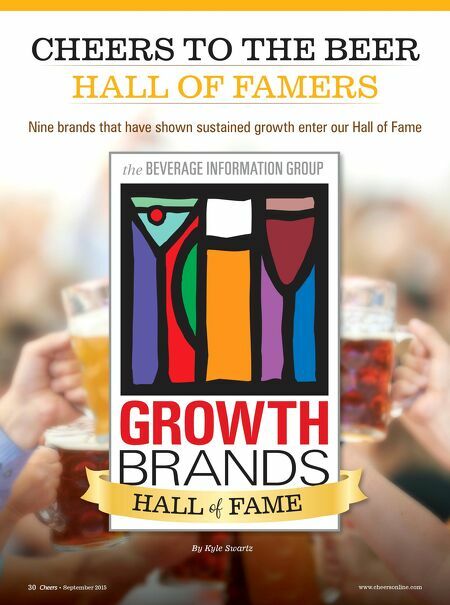 HALL OF FAME ENTRY CRITERIA Each Hall of Fame winner must have won at least 10 Growth Brand Awards out of the 19 years that the Beverage Information and Insights Group has presented them, and they must have won an award 2015. They can be in any category—Fast Track, Rising Star, Established Growth or Comeback Brand. For the 2015 Growth Brand winners and the criteria, see page 22. All statistics are compiled by Adam Rogers of the Beverage Information and Insights Group. For more information about the Hall of Fame or other research products, please contact him at arogers@epgmediallc.com. THE CLASS OF 2015 The nine beer brands inducted this year have won a total of 117 Growth Brand Awards over the years, and all picked up an award in 2015. Brand Supplier Award Total Modelo Especial Constellation Brands 19 Dos Equis Heineken USA 16 Stella Artois Anheuser-Busch InBev 13 Pacifi co Constellation Brands 12 Corona Extra Constellation Brands 12 Corona Light Constellation Brands 12 Yeungling Lager D.G. Yeungling & Sons 12 Shiner Bock Gambrinus 11 Blue Moon MillerCoors 10 BLUE MOON MillerCoors 10 Growth Brand Awards 2014 Cases sold: 29.1 million Blue Moon has risen a long way from its ballpark origins. The Belgian-style witbier was fi rst created in 1995 by brewer Keith Villa at the Sandlot Brewery. Owned by parent company MillerCoors, Sandlot Brewery is part of Coors Field, the home park of Major League Baseball's Colorado Rockies. "There are countless factors and trends that have contributed to Blue Moon's 79 consecutive quarters of growth," says Mark Rasmussen, brand PR manager for Tenth and Blake, the MillerCoors unit that produces Blue Moon. "In the beginning, Blue Moon's brewmaster and his team were extremely focused on building the brand the right way, market by market, before scaling the brand." The steady growth of the modern craft beer craze since the 1990s has also benefi tted Blue Moon. When the brand fi rst debuted, most Americans were not used to seeing cloudy, Belgian-style beers; the orange slice garnish was also a unique touch. "Since then, Blue Moon helped usher in a renaissance of craft beer by introducing American drinkers to new fl avors and styles of beer," Rasmussen says. The brand still emphasizes its craft origins. "Blue Moon's 'Artfully Crafted' campaign has been a large growth driver for the brand," Rasmussen says. "It reinforces that Blue Moon is all about a creative approach to brewing."